What did you like about City kits in 2011? JGHull: I *heart* the all amber strip that has been used away this season. My little boy has the white away strip from last year and the full kit looks ace. Under used and under appreciated that strip. SombreEthyl: I really liked the white away kit from last season too, I think adidas have done a better job with away kits for City than homes overall, I like this years Argentina blue shirt and the navy alternate shorts were a nice surprise. Using amber shorts and socks with a home shirt when away isn’t new, but this years version looks better than all the others, I’d love a pair of those amber shorts. What did you loathe about City kits in 2011? JGHull: Whilst the sponsor was contentious, I think the lack of foresight as to how their logo would appear on the striped home shirt was a bigger issue and being honest, a bit of a clanger. 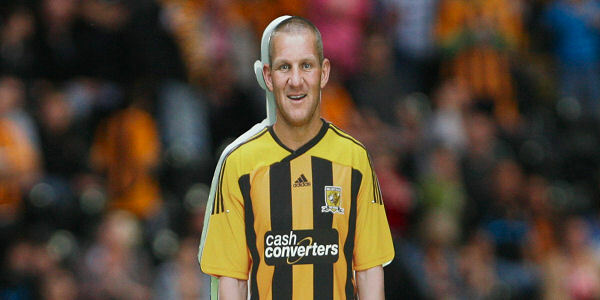 At least the away shirt sponsor was applied properly – in the end. SombreEthyl: That black sponsor patch on this years home shirt is just awful. I’m not impressed by the calibre of the company sponsoring us, regardless of how much they paid, but even letting that go, they didn’t need to ruin what is a better home shirt than the one it replaced. The yellow undershirts worn with short sleeve jerseys irritate me, I wish players would just wear long sleeved jerseys, and I didn’t like the constant mixing of bits of home and away kit last season. What other kits have you liked in 2011? JGHull: Inter Milan away, River Plate away, a splendid kit from Adidas for the Chelsea third strip, the newly released Germany kits (both) for use at Euro 2012 and the away kit Sweden wore at Wembley. As you can see I have a thing for contrast sashes on shirts, although I’d have moved the details of the fixture on the chest into the sash below the double diamond branding. SombreEthyl: Initially I wasn’t keen on AC Milan’s thin stripes, but now I love that shirt. 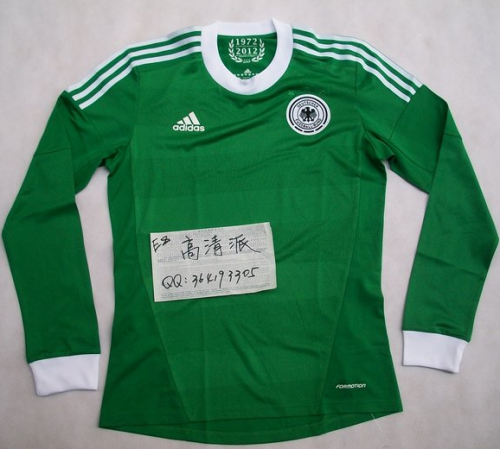 I agree about Germany’s kits, that green away shirt is gorgeous. Umbro have been consistently good the last few years, the current Peru shirt is delicious, Sweden away rather lovely, and I like the navy England away shirt and respect the brave choice to go away from red. Coventry’s retro kit is lovely, it deserves to be worn by a better side, and Darlington’s Errea home shirt is uncharacteristically good. What other kits have you loathed in 2011? JGHull: There are a few in the MLS which make me feel a bit “kit sick”. New York Red Bulls take branding to a whole new, and unacceptable, level and as someone who owns a few LA Galaxy bits of kit, the new kit is ruined by a horizontal yellow pipe across the collarbones. Not quite sure what Adidas were thinking there. SombreEthyl: Nike have produced a few horrors this year, that Barcelona shirt with the stripes that change width is rank, I don’t like the fuzzy striped Juventus shirt either. My estimation of Puma kits is quite low, but even by their standards they messed up Newcastle’s home shirt, it’s ‘orrible! SombreEthyl: That Cash Converters go bust, voiding their deal with City. Failing that, Tiger Leisure releasing an unsponsored batch of replicas would be nice. Using Milan’s template for the 2012/13 home kit shirt be ok with me, as would using the Germany away kit for City’s change duds, we could sing the “who sometimes play in green” bit of ‘Black and amber team’ again. England need to drop the lighter shade of blue for the shorts, back to navy for the Euro 2012 kit please, and Puma, please, please, don’t make Borussia Dortmund look ridiculous. I totally agree with you about the AC Milan shirt, the first time I saw the thin stripes I hated them but saw it the other day in a shop and now must say it is a real classy shirt. I liked the mixing of kits last season. Always prefer to see City in a black and amber shirt so if swapping the black shorts allowed that, that’s good for me. Also I really like the look of the black and amber stripes with white shorts, similar to AC Milan. We’ve even done that once or twice with home kits in the past, and if the shirt has a white collar it goes beautifully. White shirt with black shorts looked fine too. Only gripe was when kits got mixed up unnecessarilly; was Johnny Eyre trying too hard to earn his keep? I’d not seen that Darlo shirt before: it’s a classic, really simple and neat. I’d like to see that for a City away shirt. Love the amber shorts with the home kit this season! and just while im on here, i just want to say that i am an avid Hull City shirt collector, and this website is perfect 😉 love it! keep up the good work guys! Avid collector eh? We’ll be running a ‘Get your kits out’ feature soon if you want to show off your stash.